IF YOU ARE PRE-ORDERING FOR A SCHOOL EVENT, PLEASE INCLUDE THE NAME OF YOUR CHILD'S SCHOOL IN THE NOTES SECTION! A great school story, and relatable for any kid, but with really spot-on attention to how our differences can be magnified by our peers and our elders, especially in middle school. Friendship and humor make this such a well rounded narrative that keeps this lighter, and more than an issues book. This is going to be a great new addition for graphic novel lovers. This is a must read for all kids and adults. Jordan is an 11 year old kid, who commutes to a fancy private school. He has to figure out how to fit in with his old neighborhood as well as his new school, as the new kid dealing with micro aggressions and assumptions. In addition, the drawings are so evocative as to what Jordan is experiencing. An original full-cast audio adaptation of the graphic novel from award-winning author-illustrator Jerry Craft, performed by the author with Jesus Del Orden, Nile Bullock, Robin Miles, Guy Lockard, Peyton Lusk, Rebecca Soler, Dan Bittner, Phoebe Strole, Marc Thompson, Miles Harvey, and Ron Butler. 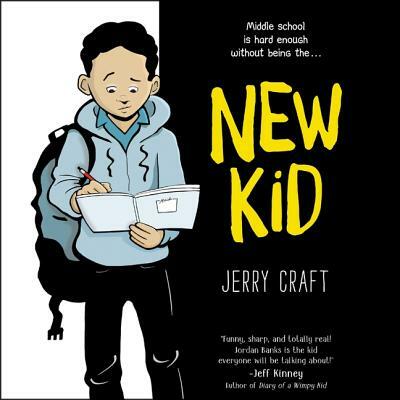 Perfect for fans of Raina Telgemeier and Gene Luen Yang, New Kid is a timely, honest novel about starting over at a new school where diversity is low and the struggle to fit in is real. As he makes the daily trip from his Washington Heights apartment to the upscale Riverdale Academy Day School, Jordan soon finds himself torn between two worlds--and not really fitting into either one. Can Jordan learn to navigate his new school culture while keeping his neighborhood friends and staying true to himself? Filled with sound effects and original music, this audio adventure is one the whole family will enjoy.